Santa Susanna is located just 60km from Girona, or 75km from Barcelona, a beautiful beach resort on the Costa Brava. We will book flights for you at the best possible rates available at time of booking with the plan being to get you into Barcelona or Girona as early as possible. Pick up from airport, transfer to hotel Aquamarina. Check in and then enjoy some riding in the afternoon. If you have booked a rental bike our staff will help you set up. During the afternoon ride the group will head out into the surrounding hills for a gentle ride of 15-20 km on some of the enduro trails that will be in tomorrows race. 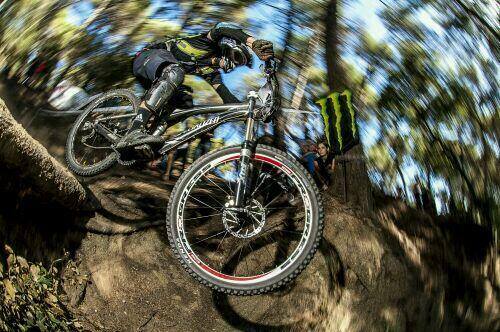 For those racing* it will be rise and shine today because we are participating in the Pineda Rocs Enduro Race. This is the last race of the Catalan Championship and you will get a taste of the great atmosphere here in the hills down by the Mediterranean Sea! After the event, a live concert will lively up the place while we enjoy the barbecue with typical Spanish food and a few cold beers! *We can also arrange a guided ride for those not racing. Or of course you can just go to the race and spectate. 09:30 Shuttle bus to ride the best trails of the Montnegre Nature Reserve. We will keep the climbing to an absolute minimum today! After lunch we will continue our quest for the ultimate descent! It´s all about fun today! Big ride today. We take the shuttle bus to a descent known as the “King’s Throne” an absolute blast of a 30-minute descent that combines a challenging forest trail with steep rocky sections, drops, dazzling switchbacks and fast rolling singletrail. In the afternoon we will go riding in the Riudarenes Forest, an area riddled with 18 world class trails! This hidden gem is absolute heaven for fun loving Enduro riders! Even with little experience, you will want to ride these trails over and over again! 09:30 We take the shuttle bus to a tiny town called Santa Coloma de Farners (30 min). The last 4 km to the start are accessible only by bike. Get ready for an unforgettable descent! Most riders want to be shuttled back up straight away for a second run! 13:00 after lunch we take the shuttle bus to the nearby Riudarenes Forest where we will ride some of the 18 world class enduro trails. This is without a doubt one of the best spots of Catalonia. Fun for everyone in this “Enduro-Disneyland”! We have two bikes available for hire, click on the links to see more details. Both are made by Orbea, the OCCAM AM H50 at a cost of €80 or the Rallon X3 for €110.